Dr. Brown's Microwave Steam Sterilizer Bags are the perfect baby bottle (and parts) sterilizing solution for on-the-go parents. Each of the 5 bags included can be re-used up to 20 times. The bags fit compactly in your diaper bag and are a lifesaver for those times when you really need to sterilize a bottle but aren't at home. We also offer Dr. Brown's Microwave Steam Sterilizer which do the same job as the Microwave Steam Sterilizer Bags, but is the prefered at-home sterilizing solution and not designed for travel per se. 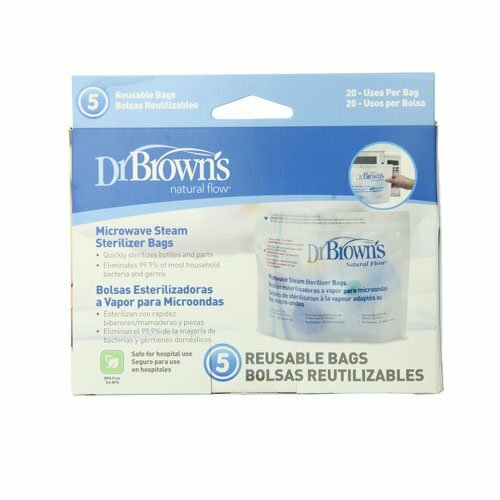 The Dr. Brown's Natural Flow Microwave Steam Sterilizer Bags sterilizes parts from Dr. Brown's baby bottles, eliminating 99.9% of most household bacteria and germs. They are designed to fit all Dr. Brown's baby bottle parts, and they are perfect for steam cleaning while on‐the‐go or while traveling. Five sterilizer bags come to a pack, and each bag is reusable – up to 20 times. This offers moms 100 uses per retail pack.